The label Anuradha Ramam epitomizes style, tradition and refinement in fashion. Her design and style caters to the taste and preference of self-assertive modern woman. Her designs display tradition, sophisticacy and youthfulness. Her distinctive style of designing clothes by blending ancient heritage with modern twist is commendable.Her deep sense of aesthetics, understanding the ever changing trend helps her design the best outfits for women. She does lot of research and experiment before revamping the old trend or style. Anuradha Ramam is not only a designer but also a painter. These abstract artworks describe more about her creativity and her involvement with art. These paintings make her store look even more vibrant and colourful. It exhibits the streak of creativity, she possess. These are acrylic paintings done on canvas. She puts her thought and creativity on canvas with colours. She also redesigns vintage heirlooms which generally lie in our store room. She gives those heirlooms a new shape and look. Apart from clothes, paintings, redesigned antique pieces, she also has good collection of accessories like charms, rings, earrings, necklaces, bracelets, pendants and gemstone jewellery. All these are distinct and unique from each other; its exquisite look will surely catch your attention. Ramam’s forte lies in converting a traditional piece into something unconventional by adding generous dose of creativity. Ramam’s collection include colors like blood red ,mustard yellow, turquoise and lime green.... to name a few. 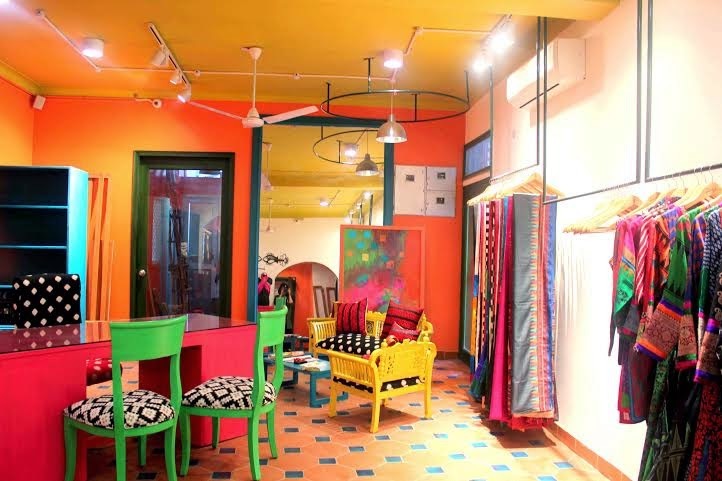 Address : 141- A/2, GF Shahpur Jat, New Delhi 49. The price range starts from Rs. 6500 onwards . 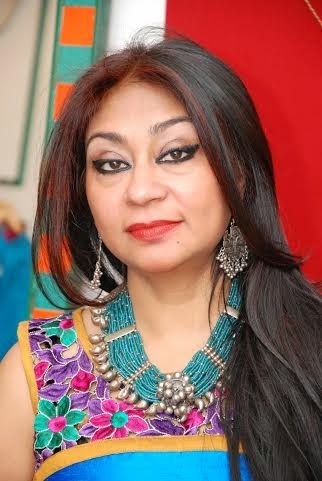 Anuradha Raman, the designer is creating waves due to her unique sense of fashion and contemporary style. Ramam is born and brought up in Haldia, an industrial town in West Bengal. She graduated in English Literature from St. Xavier’s College, Kolkata..After seeing plentiful of local artisans pursuing their myriad crafts, her interest towards designing and creativity got inclined. Anuradha has created master pieces by adding streak of creativity to old crafts. She’s innovative and at the same time believes in preserving the ancient heritage by giving it a modern look. She has always helped poor and deserving artisans and weavers to come in the limelight by bringing their creation into the eyes of people. They have always been neglected but due to Anuradha’s sincere effort, they are getting rewards and recognition now. Anuradha has been supporting over 350 weavers and artisans of Andhra Pradesh and West Bengal. The weavers have been creating some amazing designs and creations for her. She always takes their assistance in designing her master piece. Most of her designs are hand woven by these weavers and artisans. By involving them in her work, she helps those weavers and artisans to earn their livelihood and get the best price for their creativity and effort. She believes in creating unique designs which can be done only if something is hand made. She does not believe in machine usage for creating her designs or artwork. Each of her designs of her collections is exclusive and one piece is better than the other. She believes in perfection and her artwork displays the effort and creativity that has been put in to make them perfect. Anuradha is not only a designer who puts in her best effort in work but also a good human being who believes in serving the society by involving neglected and poor artisans and weavers.She has given them a platform to showcase their talent and creativity. She works with numerous NGO’s like Tamanna and Save Children India. She believes in doing something good for the society and that is why she has worked with different NGO’s like Tamanna and Save Children India. Not only this, she also works for social cause by conducting exhibition and fashion events. The revenue that she generates from these events are donated for noble cause. She also donates from her monthly salary so as to provide better means of living to these poor artisans and weavers. She works for the upliftment of the society.